These terms and conditions (“the Terms”) govern your use of this Mediaplanet International AB (“Mediaplanet”) web site (“healthawareness.co.uk”). If accessing the web site you are agreeing to the Terms. Please read through the Terms carefully. If you do not agree with the Terms, cease using this web site. Mediaplanet, any of its business divisions and / or its subsidiaries, associate companies or subsidiaries to subsidiaries or such other investment companies (“associate entities”) reserve their respective rights to revise these Terms and Conditions at any time by updating this posting. You should visit this page periodically to re-appraise yourself of the Terms and Conditions. Mediaplanet shall not be liable if the content of this web site or any viewing of it by you is contrary to the laws applying in the place where you access it. If you have any doubt, you should cease using this web site. Visitors are prohibited from violating or attempting to violate the security of the web site, including, without limitation, (1) accessing data not intended for such user or logging into a server or account which the user is not authorised to access, (2) attempting to probe, scan or test the vulnerability of a system or network or to breach security or authentication measures without proper authorisation, (3) attempting to interfere with service to any user, host or network, including, without limitation, via means of submitting a virus or “Trojan horse” to the web site, overloading, “flooding”, “mail bombing” or “crashing”, or (4) sending unsolicited electronic mail, including promotions and/or advertising of products or services. Violations of system or network security may result in civil or criminal liability. Mediaplanet and / or its associate entities will have the right to investigate occurrences that they suspect as involving such violations and will have the right to involve, and cooperate with, law enforcement authorities in prosecuting users who are involved in such violations. Similarly, this web site can be made accessible through a link created by other web sites. Access to this web site through such link/s shall not mean or be deemed to mean that the objectives, aims, purposes, ideas, concepts of such other web sites or their aim or purpose in establishing such link/s to this web site are necessarily the same or similar to the idea, concept, aim or purpose of this web site or that such links have been authorised by Mediaplanet and / or its associate entities. We are not responsible for any representation/s of such other web sites while affording such link and no liability can arise upon Mediaplanet and / or its associate entities consequent to such representation, its correctness or accuracy. In the event that any link/s afforded by any other web site/s derogatory in nature to the objectives, aims, purposes, ideas and concepts of this web site is utilised to visit this web site and such event is brought to the notice or is within the knowledge of Mediaplanet and / or its associate entities, civil or criminal remedies as may be appropriate may be invoked. Use of this web site is subject to Swedish law. This website and its content is copyright of Mediaplanet International AB – © Mediaplanet International AB 2019. All rights reserved. Headings in these Terms are for convenience only and will have no legal meaning or effect. Mediaplanet use Google Analytics to analyse the users’ use of our website. Google Analytics is used on this website. Google Analytics provides MPI with aggregated data in order to help us make informed business decisions. Ultimately, Google, as a third party, controls information collected through Google Analytics and you could check Google’s privacy practices prior using our website. You may review information about Google’s privacy practices with respect to Google Analytics here. Health Awareness relies on advertising revenue. In order to serve ads to our visitors, our websites are connected to various Advertising Networks. For those network to show relevant ads to you when you visit our websites, they collect data via their 3rd party cookie. 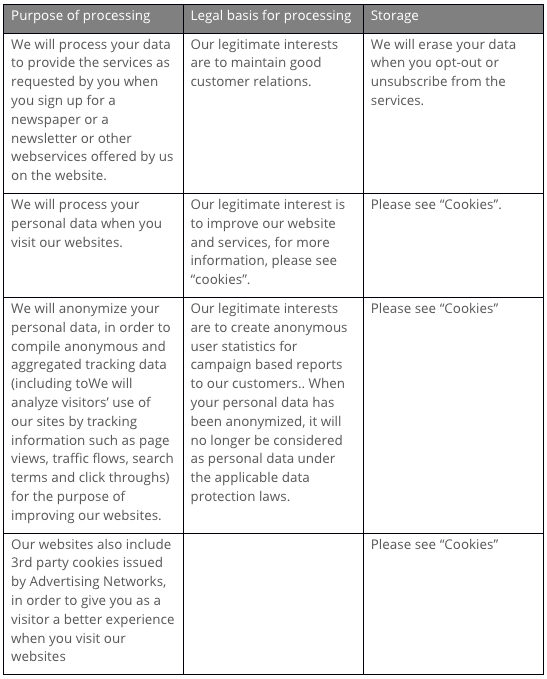 These cookies collect information about your browsing habits in order to make advertising more relevant to you and your interests. They are also used to limit the number of times you see an advertisement as well as help measure the effectiveness of an advertising campaign. The cookies remember the websites you visit and that information is shared with other parties such as advertisers. MPI has implemented technical and organisational security measures to protect your personal data, such as traceability, disaster recovery, access limitations and policies and guidelines and in order to ensure that employees only access personal data on a need-to-know basis.